Welcome to the MICHIGAN CORN PERFORMANCE web site. Corn performance trials are conducted annually to provide farmers, extension personnel, and private seed companies with agronomic information on corn hybrids submitted by private seed companies. 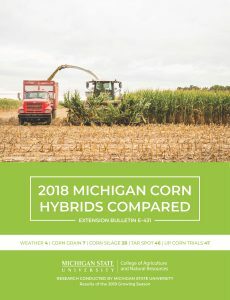 The 2018 Michigan Corn Hybrids Compared will be published as the Michigan State University Extension Bulletin E-431. Click on the bulletin cover above to download the complete 2018 bulletin. Links to the 2018 yield data are posted below by zone and trial. 110 Day and Earlier .